OM VISA Consultancy - Global Immigration, Students, Visitor, Business & Work VISA Consultants: STUDY IN UK – WORLD’S LARGEST FINANCIAL CENTER...!!! !With the help of OM INTERNATIONAL...!!! STUDY IN UK – WORLD’S LARGEST FINANCIAL CENTER...!!! !With the help of OM INTERNATIONAL...!!! STUDY IN UK – WORLD’S LARGEST FINANCIAL CENTER!!!! OM International Consultant is one of the leading visa consultants providing overseas education and immigration services. Our commitment and dedication are reflected in our day to day work. The knowledge, expertise, wisdom, and competency acquired during all these days give us unprecedented leadership and a solid reputation. OM International Consultant Immigration and Education Services is an established company with expertise in several verticals of immigration, international education, and career counseling. OM INTERNATIONAL as it is already known has consistently been delivering quality and reliable services to all sector be it with professionalism, time frame and delivering right attitude to the client, With our strong team of professionals, strategic network in global corners, we have been successful immigration aspirants with better future and students who want to pursue higher education in reputed institution and also seeking better career opportunities in countries like Canada, USA,UK,New Zealand, UK, Singapore, Australia or Europe we give them step by step guidance and help them to achieve their dreams. We have an array of creative ideas, with which we plan to increase the number of extended services we can provide to our clients and business partners. OM INTERNATIONAL has been very active and has an amazing success ratio. The United Kingdom is a developed country and has the world’s fifth largest economy by nominal GDP and ninth largest economy by purchasing power parity. The UK institutions consistently rank among the best in the world and qualifications are internationally valued and recognized. UK institutions offer the flexibility of choice and enable you to blend academic and vocational courses of your choice. The teaching and study methodology used in the UK gives you the freedom to be creative and develop skills sets and confidence. 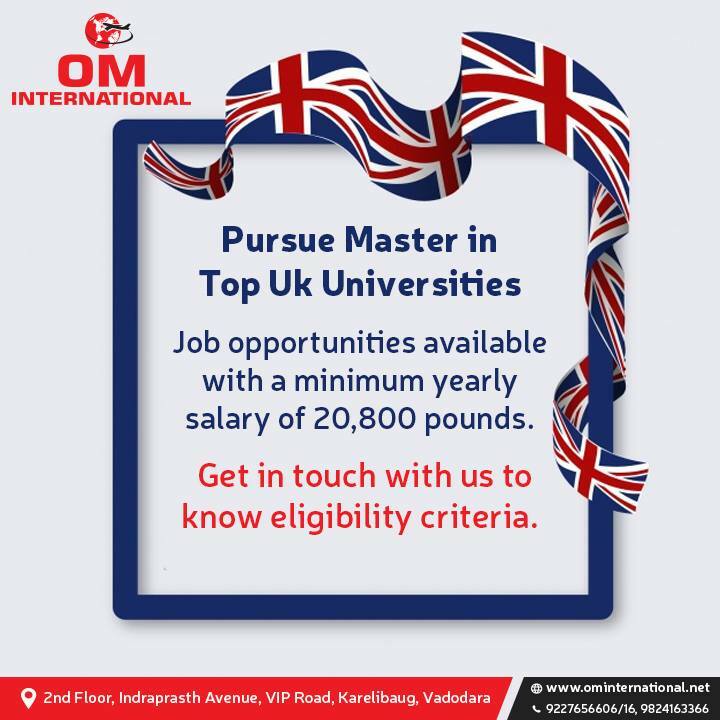 UK degrees can be tailored to your interests and often include specialized modules. The UK is the home of English hence an ideal place to develop language skills and enhance employment prospects. · Internationally Recognized Universities: UK higher education and qualifications have a remarkable international reputation and the UK degree is recognized by global universities, top employers and government bodies. · Quality Education: Many countries would like to follow the UK’s education system, as its quality is considered the best in the world. · Unique Culture: The unrivaled cultural diversity of life in the UK gives you the chance to experience a multicultural environment, meet fellow international students and develop a range of skills that are necessary to be part of today’s global workforce. · Support System: International student societies besides organizing parties, conducting events, planning activities,, and outing help in your bad days, giving advice to personal problems and assists you. There are hundreds of jobs and work experience opportunities for students and graduates in London. International students who study a full-time undergraduate or postgraduate degree course at a recognized university are allowed to work part-time during the term for up to 20 hours a week and full-time during the holidays. There are thousands of part-time student jobs in London to help support your studies. Many universities have careers and work placement centers to help you find employment. You can work up to 10 hours a week if you are studying a course that is below degree level at a Higher Education Institution (HEI) and also if you have immigration permission as a Tier 4 (Child) Student and you are at least 16 years old. Tier 5 Temporary Worker visa allows you to work in the UK for up to 12 or 24 months (depending on the scheme you’re applying for). International students in the UK can apply for the Tier 5 (Government Authorized Exchange) visa to undertake work experience and internships in the UK after their studies. You can apply to switch from your Tier 4 visa to this visa from within the UK.